This is CME on ReachMD! 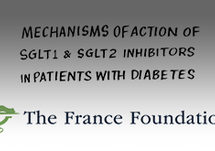 This CME activity, “When Insulin Isn’t Enough: Exploring Dual SGLT1 and SGLT2 Inhibition in Type 1 Diabetes” is brought to you by the France Foundation. Your host is Dr. Shira Johnson. Type 1 diabetes is on the rise and is increasingly being diagnosed during adulthood. Tight glycemic control is key to preventing disease complications such as cardiovascular or renal disease, yet few agents beyond insulin have proven effective in this regard. Last year, clinical trial results for a dual SGLT-1 and SGLT-2 inhibitor demonstrated efficacy, joining other SGLT inhibitors that have been shown to provide effective glycemic control as an adjunct to insulin in this patient population. This is CME on ReachMD, and I’m Dr. Shira Johnson. Joining me to shed more light on Type 1 diabetes management with a focus on dual SGLT-1 and 2 inhibitors are Dr. Anne Peters, Miss Donna Miller, and Miss Jana Conley. Dr. Peters is a Clinical Professor of Medicine with the Keck School of Medicine at the University of Southern California. Miss Miller is a nurse practitioner and a certified diabetes educator, also with the Keck School of Medicine. And Miss Conley is a patient of Dr. Peters who was diagnosed in childhood with Type 1 diabetes. She joins us from Los Angeles, California. Dr. Peters, Miss Miller, Miss Conley, thank you for joining us today. I’m very glad to be participating. So, Dr. Peters and Miss Miller, let’s begin with you both to talk about some of the clinical updates first. Dr. Peters, can you briefly describe some of the characteristics of patients with Type 1 diabetes compared to those with Type 2, and some of the unmet needs for these patients? Certainly. So people tend to think of skinny, childhood onset people, and while those exist, you can have new-onset Type 1 diabetes at any age. Those patients are treated differently from patients with Type 2 diabetes, because they need to have insulin for life. Sometimes it can be very hard to tell Type 1 versus Type 2 diabetes because, just like our normal population, as people with Type 1 diabetes age, a third are overweight, a third are obese, and a third are lean.. But clinically, if you have a leaner patient, a patient who seems to need insulin earlier on in their disease, someone who has other autoimmune disease, those are people who, particularly in adulthood, could have new-onset Type 1 diabetes. Type 2 diabetes tends to happen in people who have a family history of Type 2 diabetes, who have risk factors. It’s a more slowly evolving condition. One of the ways you can diagnose Type 1 diabetes is to measure anti-GAD antibody, and that’s a commercially available test. Miss Miller, what treatments are currently FDA approved and available for glycemic management in Type 1 diabetes? Well, currently, 2 classes of medications are approved. The first one is insulin, as Dr. Peters said. . There is basal insulin or a long-acting and intermediate-acting insulin. They vary from their onset and duration. They also can vary in their dosing schedule. There’s bolus or rapid-acting insulin. And this is used to cover the intake of their carbohydrates and also for correction of high blood glucose. We still have some of the older forms of insulin, and there are various percentages of mix of long-acting and rapid-acting insulins. And in patients that are requiring very large doses of insulin—there’s concentrated regular insulin.. The type and the concentration that we use in patients needs to be individualized based on their needs. The other medication that’s FDA approved is pramlintide. It’s also an injectable medication, and it is based upon the human amylin that is produced in the pancreas. The good effects are that it can lead to a reduced appetite and it can help lower postprandial glucose levels. . The problem is that it has some significant side effects. It has to be used very cautiously with insulin because it can lead to profound hypoglycemia. And it can cause profound nausea. While that will help people take in less calories, it’s not a way to live. Most people, after a few months, give up. And, Dr. Peters, what other treatments may be used but remain investigational at this point? So we’ve basically tried most of the agents for treating Type 2 diabetes in people with Type 1 diabetes. So metformin is the foundational therapy for Type 2 diabetes, but there is not a lot of benefit of adding metformin to insulin in patients with Type 1 diabetes. In terms of trying to add incretin-based therapies, the GLP-1 receptor agonists, these are good agents in Type 2 diabetes; they cause weight loss, A1c reduction, and have cardiovascular benefits. They have tried them in patients with Type 1 diabetes, but have also shown no improvement in terms of A1c reduction. 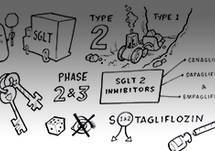 But the SGLT inhibitors, which include the SGLT-2 inhibitors as well as one SGLT-1/2 inhibitor, are really being looked at in terms of their benefits, and off label, people like myself have been using the SGLT-2 inhibitors fairly often in patients with Type 1 diabetes. We can show benefit in both glucose reduction as well as weight loss, and in those who are hypertensive a reduction in blood pressure, so it’s the most exciting class for Type 1 diabetes. That is really exciting. And continuing on that line, Dr. Peters, how do the SGLT inhibitors work specifically, and what role should they play in complementing insulin? When you use an SGLT-2 inhibitor or an SGLT-1/2 inhibitor, they’re in essence diuretics for glucose. By inhibiting SGLT-2, you basically don’t absorb the filtered glucose from your kidneys so you lose it in the urine. By doing this, you have patients lose weight and their blood sugars get better. It’s an insulin-independent mechanism; you don’t have to be making your own insulin for these drugs to be effective. Then the SGLT 1/2 inhibitors also inhibit SGLT-1. And SGLT-1 is found in the intestine, so you reduce the GI absorption of glucose as well. Sotagliflozin, the first of these dual inhibitors, has been presented to the FDA and is going to be evaluated in the next few months. So, do you think that having the added effect of SGLT inhibition in the gut can give an extra advantage? I think it could. I think that it’s too early to know, and head-to-head trials comparing an SGLT-1/2 inhibitor versus an SGLT-2 inhibitor are underway. For the moment, we know from the data with the SGLT-1/2 inhibitor that it is effective in terms of glucose lowering in people with Type 1 diabetes, and you get all the benefits that we expect. I’m looking forward to hearing more about the clinical trials, but first, I’d like to turn to Jana Conley for perspectives on the patient experience. Miss Conley, can you share with us your experiences with Type 1 diabetes and maintaining glycemic control with insulin? Sure. I was diagnosed as a child. I was about 8 years old, so it’s been about 3 decades. Insulin has been a mainstay for me, obviously. And obviously there are challenges, but really the biggest changes have been the speed of the insulin, and so now it works a lot faster. I use one that’s a bolus for when I eat and one that’s time-released, Now there are pens that make it a lot easier to keep it with you when you’re moving and traveling. I’m a patient of Dr. Peters. One of the things I needed was really helping with the variability. I don’t think people realize that when your blood sugar goes up and your blood sugar goes down, that you don’t feel very good when that happens. You really want to get yourself to midline so that you feel better all the time. So, Miss Miller, would you say these experiences are similar to those of other patients with Type 1 diabetes? I think what Jana is saying is really true, that we have much better insulin. They are more predictable. It’s easier to dose with pens. It’s come a long way. But the problem is that insulin is not a pancreas, and so it doesn’t always time out the way that people would prefer. When we’re talking about variability, it’s a really important concept to understand, and this is a very common concern and complaint.. So, for many, many years, people would be told, “Oh, your A1c is 6.8. It’s excellent.” Then we started using blood glucose meters more proficiently, so we’d have people test fasting, before a meal, 2 hours after a meal, at bedtime, before exercise, after exercise, and what were seeing was blood glucoses going all the over the place. They would be 50.They would be 300. So, we know now that the A1c is a good trending tool, but it doesn’t always tell how well somebody is doing. You can get an A1c of 6.9 and be between 40 and 300or between 100 and 180. The second person is going to have less risk of complications, they’re going to feel better, and I’ve even seen weight loss in just having less variability..
For those just tuning in, you’re listening to CME on ReachMD. I’m Dr. Shira Johnson, and I’m speaking with Dr. Anne Peters, Miss Donna Miller, and Miss Jana Conley about Type 1 diabetes management. Dr. Peters, let’s get back to discussing the SGLT inhibitor options for improving glycemic control. What do the clinical trials tell us about their safety and efficacy so far? So the canagliflozin trial was the first one, and Jana was one of the patients who was part of that trial. And there was the dapagliflozin trial and then the empagliflozin trial and those are SGLT-2 inhibitor trials. In all of them you saw an A1c reduction of about 0.5%. Now, some of the trials used differing doses of the drugs so they saw differing A1c reductions, but we also looked at composite endpoints. So you wanted A1c reduction without weight gain, and without causing severe hypoglycemia, or, as it turned out, diabetic ketoacidosis. And so, if you look at composite endpoints, all of the agents do better than placebo. And an endpoint that’s different is also what Donna was speaking of earlier, which is glycemic variability. In all the trials, for both SGLT-2 inhibitors and the SGLT-1/2 dual inhibitor, we saw reductions in variability. We also saw that patients who were assigned to the active treatment, either the SGLT-1/2 inhibitor or the SGLT-2 inhibitor, really liked how they felt. They felt better. If you look at the SGLT-1/2 inhibitor data, it was similar to that with the SGLT-2 inhibitors with about a half percent A1c reduction. It did it without causing weight gain, without increasing hypoglycemia, and there was less glycemic variability. Now, the side effect that we saw with these agents in Type 1 was an increase in risk in diabetic ketoacidosis, and this was in some cases euglycemic, which means that the blood sugars were below 200. That’s a problem because patients would come into the emergency department with a blood sugar of 150 and no one would realize that they were in DKA. So what we found is that these agents seemed to increase ketone levels. And generally, that’s not a bad thing; it might be a good thing to be a little ketotic. But if the insulin level drops—say their insulin requirement goes up but they don’t increase the dose—that can cause DKA. So what we’ve learned is that you need to educate physicians and other providers as well as the patients about this risk and how to deal with it. Miss Miller, aren’t patients with Type 1 diabetes already at a higher risk of ketoacidosis compared to those with Type 2 diabetes? Why is that specifically, and what are the clinical implications? Well, that is true that people with Type 1 diabetes are more likely to get ketoacidosis, and it really is because they don’t produce insulin.. If we don’t have enough insulin, the body can’t properly use the glucose, the body begins to break down fat to use as fuel, and the byproduct of that is ketones, which can lead to the acidosis. People become dehydrated, weak, fatigued, irritable, and short of breath, and nausea and vomiting can occur, and eventually confusion and coma can result if they are not properly treated. The key is prevention, and that’s understanding that when you have Type 1 diabetes, that you need to always have sufficient insulin. In patients that are using insulin only as their medication, it’s basically understanding the difference between their basal and their bolus insulin, how they are used, what is the storage. and use of pens. For people on insulin pumps, make sure they’re properly trained. And I always provide my patients with a pump failure plan They know what insulin dosages to begin injecting so that they can keep their glucose levels in target range. Particularly though, as Dr. Peters mentioned, when they are also on an SGLT inhibitor, we have a protocol. So there’s a few steps. Education is the first thing, on proper use of medication, like when to take it and when not to.. So, if you are sick, if you reduced your carb intake, if you are going on a long trip and you’re not sure how your body is going to respond to altitude, stop taking it. They have to have a blood ketone meter and the test strips that go with that. We have to make sure they have the proper insulin and some form of glucose monitoring, either a meter or they are on a continuous glucose sensor. The protocols tell people when to test the ketones, what levels they need to stop taking the SGLT, when they are going to need additional insulin. Another part is recognizing when they need to seek emergency care—if the ketones are high, they could be unable to access their insulin, they could be unable to keep food down. They need to know what to do before we just give them the SGLT. The other key is to be their own advocate. They may have a relatively normal glucose, but they know they have ketones because they are testing for it, and they know that they have an issue where it’s taking their own intake of carbs, and covering with insulin isn’t getting rid of the ketosis. That has to be communicated very quickly and very clearly, especially if you’re going to an urgent care or an ER where you are not sure if they understand that. I can see where being their own advocate is very important in your protocols. Miss Conley, I understand that you are now taking an SGLT inhibitor. How has this changed the way you manage your diabetes? Well, when I first started, the first thing I noticed was my blood sugars drop pretty quickly. So it took a couple days to figure out my new dosing, and at that point is when I really started to notice what it was doing. The It sort of softened the edges. Obviously, I still go up and down a little bit depending upon what I eat, if I exercise, what’s going on, but the dramatic highs and lows were limited. And by doing that alone, it just is a huge improvement in your quality of life. Dr. Peters, in closing, what are the key messages that you’d like to instill for our audience with respect to improving glycemic control in Type 1 diabetes, particularly where insulin alone is inadequate? Well, first of all, I’d actually like to encourage people to become familiar with continuous glucose monitoring because it’s a great tool for helping our patients with Type 1 diabetes. And as soon as you use that, you do see this amazing variability in some people where you realize that you really do need to do something to help them get better. We want our patients to live their lives as close to normal as they can, and I really think that the SGLT inhibitor class, both SGLT-2s and SGLT-1/2 inhibitors, have a real potential to help patients.
. We all know the usual risk of an SGLT-2 inhibitor. 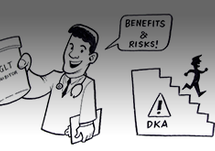 They can get an increased risk for mycotic vaginal infections, etc., but the real concern here is DKA. I think that we can really mitigate the risk, in terms of educating patients and providers. So these drugs will hopefully in the near term get FDA approval for the use in people with Type 1 diabetes. If that happens, we’ll be able to do a lot more education so we can work with our patients to help improve their diabetes, help them lose some weight, and have a better quality of life. So [I’m] enthusiastic and optimistic that we’ll be able to use these drugs more and more in clinical practice. It sounds great. Miss Conley, let’s give you the last word. What advice would you share with other patients with Type 1 diabetes who want to improve their glycemic control? Well, the number one thing for me has always been to learn to listen to your body. I think doctors are phenomenal, but we’re the only ones that know what it’s feeling like at every moment. I think you have to listen to yourself first so then you know what you’re talking to your doctor about. Absolutely, I would say that anybody with Type 1 diabetes should bring up the SGLT inhibitor to their physicians. They may not be as familiar with it. For me, it’s been a very huge change in the way that I manage the disease. And finally, for me personally—everybody is different—the biggest thing for me has been exercise. That’s made me a very healthy person, and I think that that has affected my disease a lot. For me, it’s been the drugs, the doctor, and the exercise. Well, with those insightful comments, I want to thank my guests, Dr. Anne Peters, Miss Donna Miller and Miss Jana Conley for joining me today on today’s program centered on Type 1 diabetes. It was a pleasure having you all on the program. The preceding activity was brought to you by The France Foundation. To receive your free CME credit, please be sure to complete the posttest and evaluation, which can be found at ReachMD.com/CME. 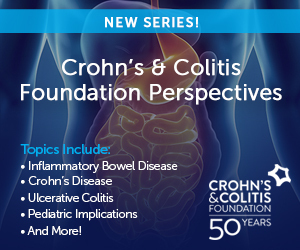 This patient-clinician panel discussion provides unique perspectives on the treatment and management of Type 1 Diabetes. 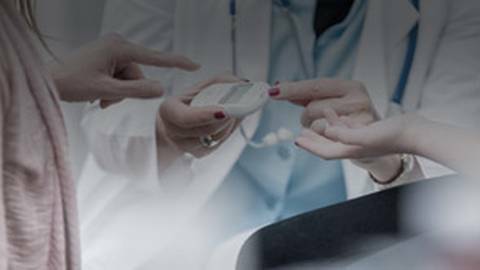 This activity explores new and emerging treatments for type 1 diabetes, including a dual sodium glucose transporter 1/2 inhibitor, and provides both clinician and patient perspectives on their use. This educational activity is intended for primary care providers and endocrinologists. Anne Peters, MD, has served as a non-CE consultant for Abbott Diabetes Care, Becton Dickinson, Boehringer Ingelheim, Eli Lilly and Company, Lexicon, Livongo, Medscape, Merck, Novo Nordisk, OptumHealth and Sanofi US. She has received research support from AstraZeneca, Dexcom and Mannkind. Dr. Peters has an ownership interest/stock options with Mellitus Health, Omada Health and Stability Health. Donna Miller, MSN, FNP-C, CDE, has nothing to disclose. Jana Conley has nothing to disclose. Supported by an educational grant from Sanofi and Lexicon Pharmaceuticals. 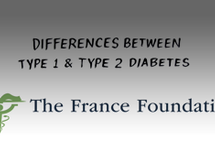 The France Foundation (TFF) requires CME faculty (speakers) to disclose when products or procedures being discussed are off label, unlabeled, experimental, and/or investigational, and any limitations on the information that is presented, such as data that are preliminary, or that represent ongoing research, interim analyses, and/or unsupported opinion. Faculty in this activity may discuss information about pharmaceutical agents that is outside of US Food and Drug Administration approved labeling. This information is intended solely for continuing medical education and is not intended to promote off-label use of these medications. TFF does not recommend the use of any agent outside of the labeled indications. If you have questions, contact the Medical Affairs Department of the manufacturer for the most recent prescribing information.